The Zembula platform gives you flexible options when running time-based campaigns. 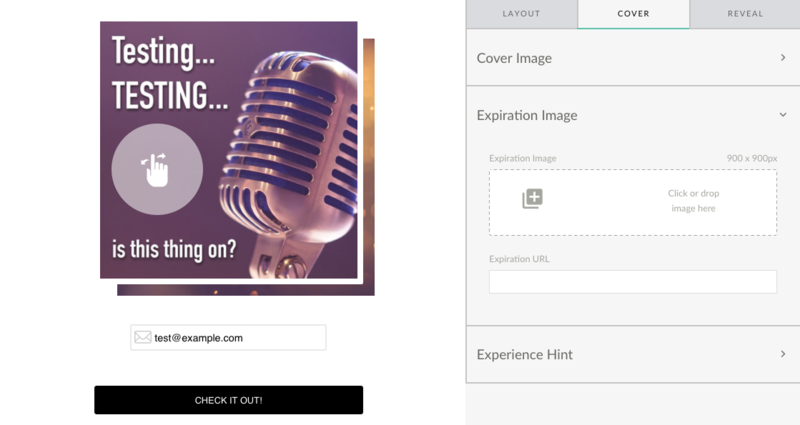 Once a campaign is expired, you want to let your audience know that the offer is no longer available, but you still want them to be able to continue the journey to your website rather than leading them to a dead end. One way to do so is to upload a custom expiration image as well as set a redirect URL that is specific to an individual Experience. From within the Experience builder, under the Cover tab, click on the Expiration Image tab. Upload a 900px by 900px image, and enter in your expiration URL. Once your Experience has expired, the image in your email, interstitial, or any page where you’ve embedded the Experience will automatically update to this image.